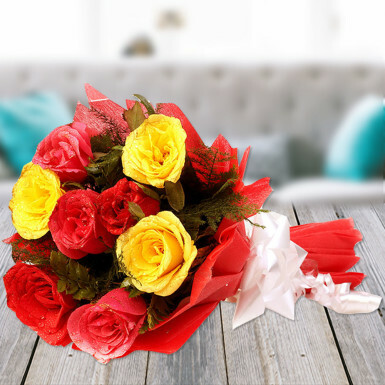 Tell the wish of your heart to the love of your life through this beautiful bouquet of 8 mixed roses which is wrapped expertly in red paper packing and tied with a white ribbon bow. Since the bouquet is full of colorful roses and hence it is the sign of happiness, love, friendship and cheerfulness. The bouquet is the perfect representation of your love and care. You can offer this bouquet to show how much you love and care. Red rose to shower love, pink rose to show romance and the yellow rose to strengthen the friendship in your relation. This is perfect offering for occasions like Birthday, Baby shower, Valentine’s Day, Propose Day, Rose Day, Wedding anniversary and many other occasions. thanks for such good service...much appreciated! A great service provider, on time delivery. I am very happy as the product was fresh. They are prestigious and their products too. I will come back for future orders!